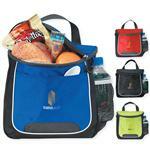 This large 24 can cooler bag is perfect for company picnics, client gifts or retreats! The lining has been upgraded this year and is foam insulated with heat sealed liner. This large cooler is unique because we can imprint either a one color or a full color patented GeoPanel process. The logo looks fantastic and the colors are nice and sharp with a white outline around the logo to help it pop off the background. 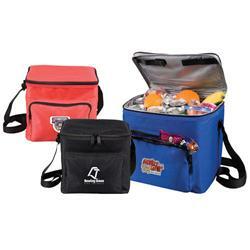 Please call us for other printed cooler ideas. No cooler is too big or to small for us to help with! 888-332-ADCO. Production Times Available: 7-10 working days. Available Imprint Options: GeoPanel, embroidery. 600D Polyester, Fully Collapsible Foam Insulated with Heat Sealed Liner. 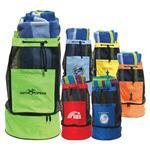 Large, Zippered Front Pocket Adjustable Shoulder Strap. Packed 30/box at 34 lbs.